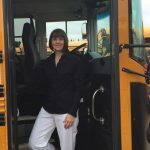 Ellen Moser began her career with Perrysburg Exempted Village School District in January 1994, with most of those years in the transportation department. She was a classroom assistant, bus driver and dispatcher before becoming the director in 2007. Ellen was appointed to fill a vacancy on the OAPT board as the Northwest Regional Director in July 2013, and we re-elected by the Northwest Region to a full term. She has also served as an officer before becoming President in 2017. A native of Perrysburg, Ellen has been married to her husband, Doug, for 30 years. She has two children, Stacy and Zach, and granddaughters, Emma and Anna.